A summary ceremony of the Microsoft Office Specialist World Championship (MOSWC) 2015 in Vietnam was held in Hanoi on June 16. Students Tran Minh Tien of Banking University of Ho Chi Minh City, Pham Truong Giang and Nguyen Thi Hien Gia of Hanoi Foreign Trade University won highest prizes at the national final round for categories of Microsoft Word 2010, Microsoft Excel 2010 and Microsoft PowerPoint 2010 respectively. 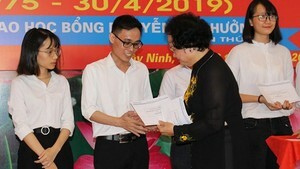 They will be representatives of Vietnam to participate in the 2015 Microsoft Office Specialist World Championship in Dallas, Texas in the US from August 9-12. MOSWC is the largest office computing contest in the world which is held annually all over the globe by U.S.-based Certiport, a world leading provider of computer science certificates. To date, the competition has been in place for 14 years globally and has entered its sixth year in Vietnam. This year competition drew hundreds of thousands of contestants from colleges, universities and secondary schools, with about 1,500 contestants selected to represent 260 school teams in the national round.